During the Syrian civil war, a terrible thing is going on. 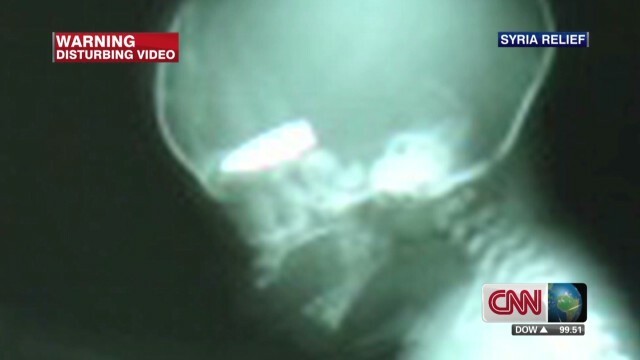 In the middle of all of the fighting, a game is going on, sniper bullets found in babies heads. See the little white thing inside that head, this 7-9 month baby, still in its mothers womb, has a snipers bullet logged inside, the mother survived, the baby didn't. Dr.Nott says that "many of these women coming to the hospital had similar wounds", as if the shooters are playing a game with these,women and children. Most of the victims are survivors, warning now, some parts of the video are graphic, viewer discursion is advised. Not only that, but the people of Syria live on the Regime side of the street, but food and provisions are on the Rebel side. People risk their lives trying to get to the other side, and sometimes don't make it home. The people of Syria fight for their lives, technically saying. But t doesn't matter where you are, you could and most likely would get shot. This goes with the standard below because these people live in the middle of the Syrian war, some people cant go to work, or buy food, The population has probably decreased because of the deaths and people probably trying to escape. You wouldn't want to cross the street because you have no idea where the shooting is coming from.